Hold a pizza party this weekend! Hey guys! Cake here, with some news about Chelle and some products you might be interested in! Consider this your update from the designers’ desk. Who doesn’t love pizza? 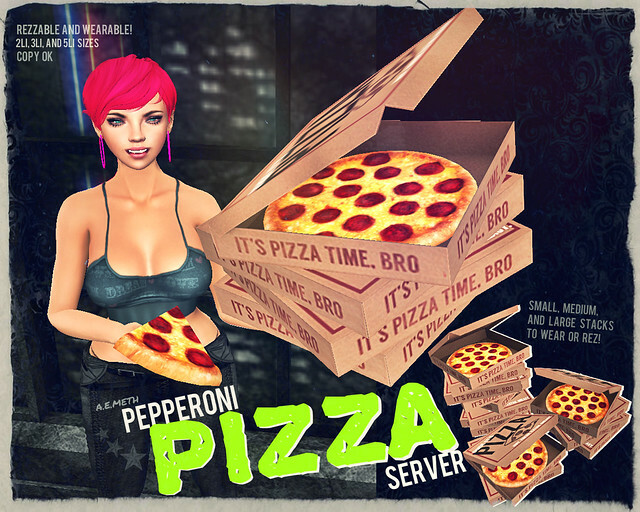 Now you can carry around pizza boxes in stacks of 2, 4, and 8! You can also rez these for as little land impact as 2. It’s a great prop for bar owners, party throwers, and roleplayers! Know what else goes great with pizza? 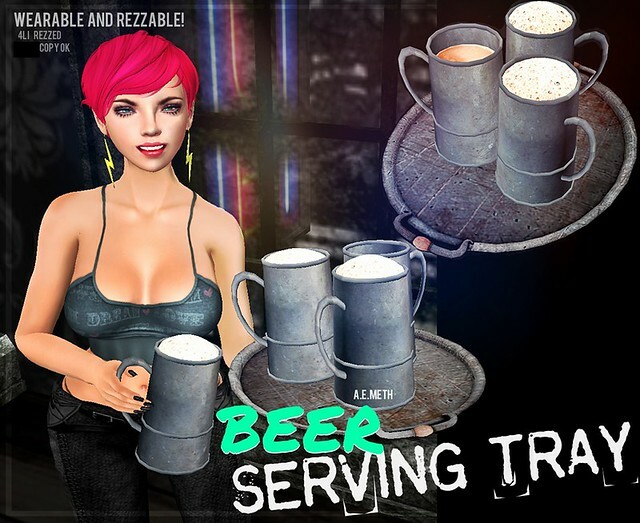 Beer serving tray! I wanted this to fit in with multiple sims, so I gave the tray a brushed metal look. You can wear or rez this, and it will distribute tankards if anyone clicks on it. Simply ‘add’ the campfire to yourself, and you’ll sit next to a nice, modest fire. It comes with extra chairs so if your friends have a campfire, you can sit with theirs instead of sitting on the ground. Now for Chelle news: Gogo and I collaborate on Chelle, and I’ve been examining the mesh heads that have come out lately. I’d like to tackle Lelutka first to create makeup for their heads. So, if you have one, please look forward to it! I’ll still continue to make regular tat layers as well. That’s all for now! Have a great weekend, everyone!